In the Pacific Northwest, trees are abundant and wildfire is a constant presence. 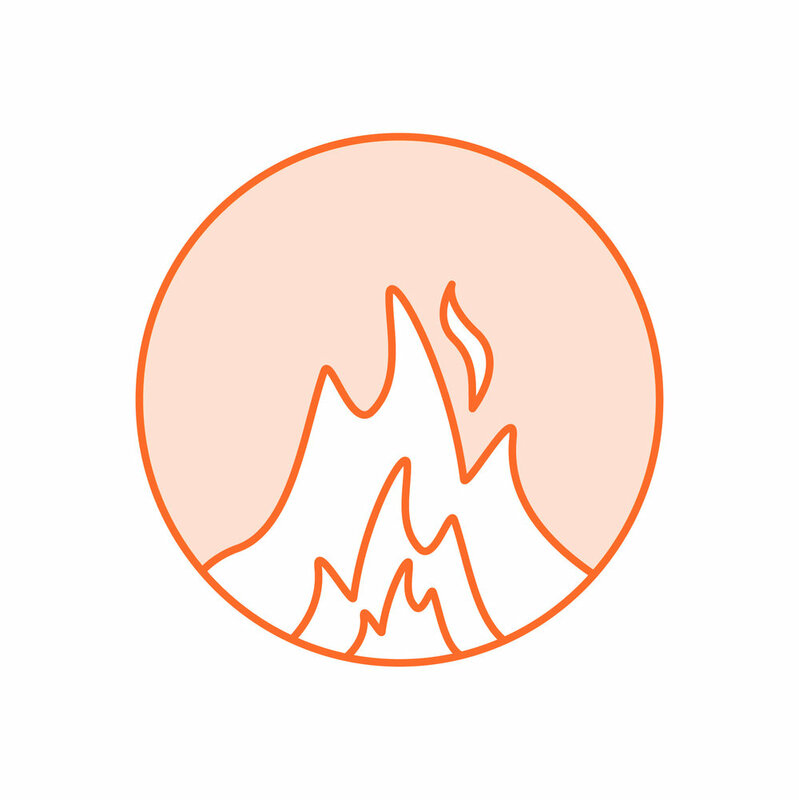 In fact, the region was beset with monumental wildfires in the summers of 2014, 2015, and 2017. These days, wildfires are often catastrophic, but historically, fires were integral to a healthy ecosystem. Sparks generated by lightning went untamed. Native Americans also used fire to care for the land. In the late 1800s, settlements, road-building, and livestock grazing began to impact the region’s forests. Logging removed the most valuable and fire-resilient trees, such as giant ponderosas in the east Cascade slope. After 1910, fire suppression became the norm for forest management, largely in response to catastrophic fires that tore through the landscape and claimed many human lives. This meant putting out any and all forest fires as quickly as possible. More recently, scientists and forest managers have reconsidered this strategy of excluding all fire. While no human has lived through the storied history of fire in the region, we can look to an iconic tree to learn about the impact of fire suppression. Imagine if you had your entire medical record, including all your checkups, physicals, and surgeries, inscribed on your skin, such that one look could provide a rough overview of all the times you were injured, stressed, or malnourished. A tree’s rings, which build just underneath the bark as seasons and years pass, are such a depiction. 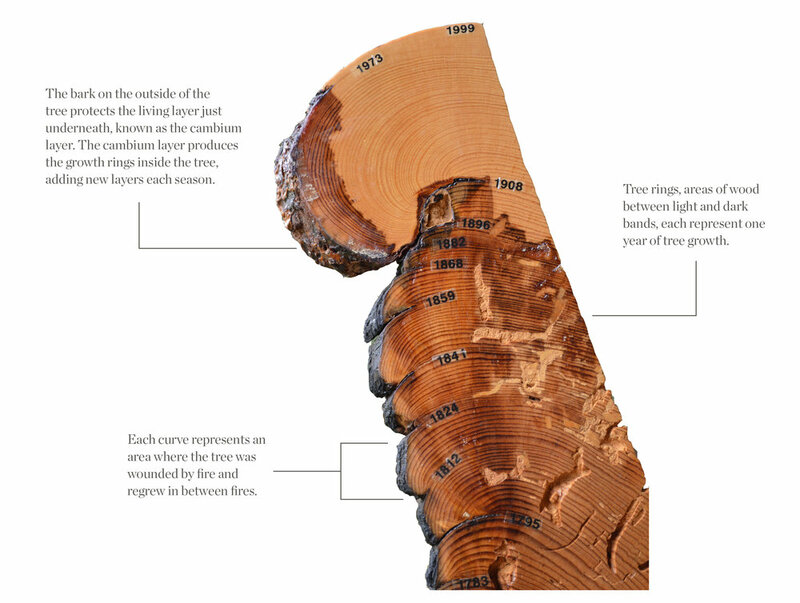 Cutting out a cross section of a tree’s trunk produces a “cookie” that gives us access to this story. Above: This cutout of a ponderosa pine (known as a "cookie") allows us to study tree rings to learn what the tree experienced. The curves on the cookie's left side (marked with years) show how the tree grew back over its wounds in response to fire. Abundant rain promotes greater growth, leading to wider and more evenly spaced tree rings, while prolonged drought result in narrower bands. Competition for water and nutrients from neighboring trees in a crowded forest can lead to slower growth and narrower rings. Thin rings can also be the consequence of insect infestations laying waste to the tree’s foliage, which would otherwise gather energy from the sun. Perhaps the most conspicuous markings on a tree’s rings, scars are the tree’s response to fire damage, protecting it against infection. The cookie clearly indicates that the tree experienced regular intervals of fire until 1908, but that this frequency declined dramatically in the 20th century. What does this change mean for trees, and what are the implications for forests? When a ponderosa pine is young, it is susceptible to fire, but by the time the tree reaches 4 or 5 years, it has begun to develop a thick bark that protects it from low-intensity fires that may sweep through every few years. 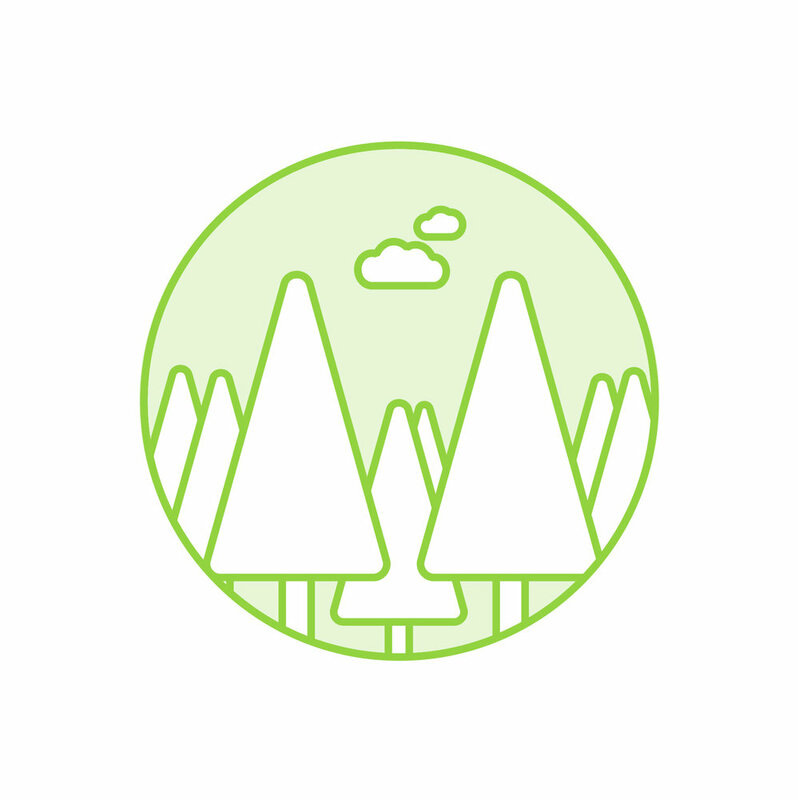 The same fires remove competition from shrubs and less fire-resistant trees, such as true firs like grand fir, and create the open sunny spaces that allow the ponderosa to grow strong and tall. With the exclusion of fire, trees that would normally be cleared out by wildfire can grow dense. 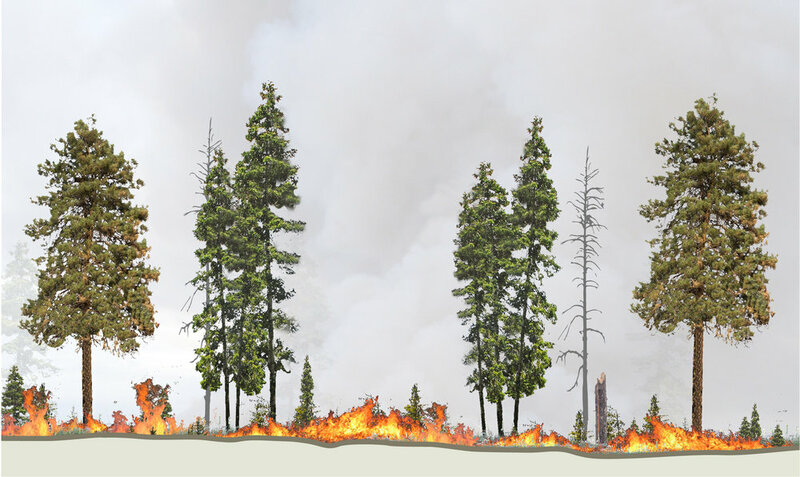 The density and layering of trees provide a path for flames to reach the high foliage of the ponderosa and potentially move from one crown of a tree to another. Smaller trees, shrubs, and brush can fuel even hotter flames, and send the blaze upward into the ponderosa pine’s crown. These crown fires are the most devastating kind of fire for pine trees. Above: This forest stand is thick and contains large and small trees in close proximity. Vegetation and other debris are crowded on the forest floor. This forest stand has been untouched by fire for almost 80 years. Above: The overabundance of vegetation and debris on the forest floor becomes fuel for wildfires to completely burn through a forest stand. As the fire moves from the ground into the trees' foliage, it burns the crowns of tall trees, causing historically resilient trees to die, too. Above: Any trees left standing are now dead (referred to as snags). While these snags are important for wildlife, they will eventually fall, too. It will take decades of regrowth to see the large trees become valuable to wildlife, carbon storage, and timber harvest again. Many more decades, or even centuries, will pass before new snags are available for wildlife. Additionally, the intense heat from the fire changed the soil composition, making it more likely to erode into streams. Paradoxically, suppressing fires ultimately increases the risk of enormous, catastrophic wildfires. The fallout is detrimental to both wildlife and human society. So, what can we do to reduce the frequency of catastrophic wildfires? We are working innovatively with tribes, the United States Forest Service, and other partners and agencies to manage forests and wildfires. This includes ecological thinning, where loggers harvest smaller-diameter trees that still hold commercial value. Such practices enable the continuity of jobs in the forest, while giving the ponderosa pine and other fire-resistant trees more room to grow. After forest thinning, professional fire teams can conduct controlled burns under safe conditions. These burns mimic the frequent, small fires that historically cleaned out the shrubs and small trees of the forest's undergrowth. Consequently, larger, natural wildfires will not lead to the complete loss of large, towering trees. Above: Thinning trees and intentional prescribed burning has resulted in a forest stand that contains large trees with space in between. Vegetation and other debris are minimal on the forest floor, making the stand more resilient to high-severity wildfires. Above: A restored dry forest with adequate space between trees can prevent wildfire from moving from the ground to the tree canopy. Above: The majority of trees are scarred at their trunks, but remain alive. The ground is covered with a mix of soil and ash, with a few snags for wildlife. This forest can regrow and withstand future wildfires, thus holding on to its timber value and ecological benefits. Future wildfires can also be safely managed if they threaten human communities. The definition of forest health depends on forest type and varies based on human and ecological needs. For the dry forests of the Cascade Range, fire plays a key role in maintaining forest health. Healthy forests mean healthy rivers and more plentiful salmon. Trees hold soil in place and filter water, keeping sediment from clogging streams. Healthy forests can hold snowpack longer in the winter and release it more slowly into the rivers in the spring, ensuring sustainable water supplies for people. Healthy forests create cleaner air and hold more carbon. Healthy forests provide habitat for wildlife, recreational opportunities for people, and ecologically sustainable jobs in the woods. Communities that are mostly black, Hispanic or Native American experience 50 percent greater vulnerability to wildfires compared with other communities. Wildfire is a dangerous threat to shrublands in Washington. Watch this new video to see our recovery efforts take root after a 2017 fire. Wildfires can be catastrophic, but did you know that fire can also be healthy?